For Rodeo Bull hire in Greater Manchester and the North West, contact Rodeo Empire. Our drivers will deliver to anywhere in the North West of the UK, providing your party with the ultimate in Rodeo Bull Hire or Rodeo Bull event. From a gentle Bull to a raging bull our Rodeo ride will ensure you have the ultimate ride. Competition programs and timers can make a fun atmosphere for you and your guests (included free). The longer you can hold on the fast the bull will become. Once the rider has dismounted the ride will automatically stop making a safe and fun simulation. 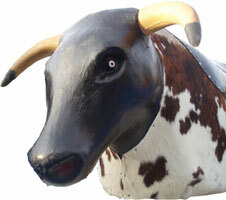 The Rodeo Bull features flashing eyes and real cow hide to make the ride look and feel just like the real thing. To cope with demand, we have more than one Rodeo Bull and should you be comparing our service with another company please feel confident we have a backup and remain fully reliable. All the units from Rodeo Empire are clean and replaced on a regular basis. We are proud to have held bookings with major clients such as Manchester City Council, Mercedes Benz, Total Fitness, Manchester United Football Club and many other major events. For all of your Rodeo Bull hire needs in Manchester and the North West, contact Rodeo Empire Castle Hire today. You can book online or via phone. When you book online no deposit is required and you can cancel the event of bad weather with no penalty. *The Rodeo Bull may also be known as a Bucking Bronco or Bull Machine. 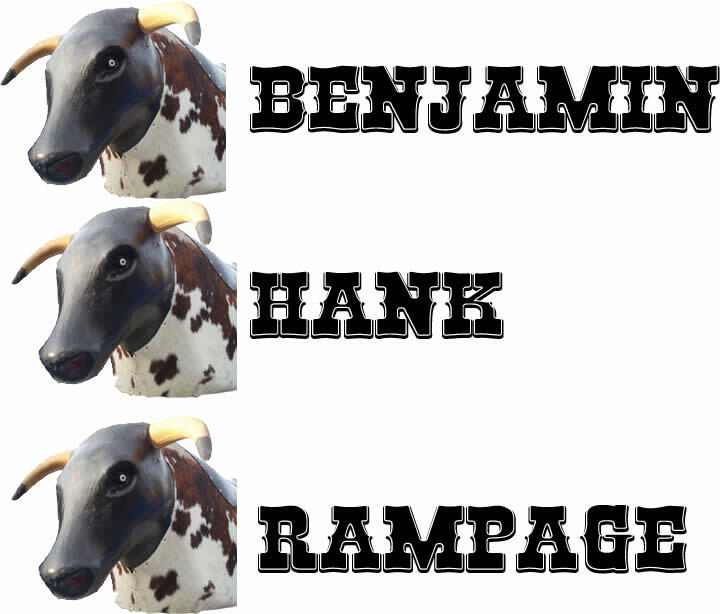 Rodeo Bulls are dispatched at random and it is not possible to select a particular name. Delivery charge will be applicable if outside Manchester and we will deliver to the whole North West including Bradford, Leeds, Southport, Preston and all other North West areas.